This article was written by Shambhavi Suyesha, a student of KIIT School of Law. Before focusing on this sorry state of our country lets know the term stunting first. According to “End of Childhood Index” prepared by Save the Children (US based international organisation) , stunting is a condition that ‘keeps youngsters from developing to their full potential, both mentally and physically’ when a child does not get sufficient nutrients. It is caused because of chronic malnutrition in first 1,000 days of a child’s life. One of the popular newspaper in our country, The Hindu defines Stunting as a form of malnutrition in which children are shorter than normal for their age and is largely irreversible after the age of two. They grow up physically and intellectually weaker than their better-fed peers. In another word Stunting is defined as a situation where a child is short for his/her age and indicates that the child has not developed as he/she should, physically or cognitively. It is related with an under developed brain, with long lasting harmful outcomes, including decreased mental capacity and learning limit, poor school performance in childhood, less earnings and increased dangers of nourishment related endless illnesses, for example, diabetes, hypertension, and obesity in future and it begins from pre-conception when a young girl and who later progresses toward becoming mother is undernourished and iron deficient; it worsens when infants’ eating regimens are poor, and when sanitation and cleanliness is insufficient. It is irreversible by the age of two. Child survival and growth is indistinguishably associated with reproductive and mental health. Moving towards the theme of our article let’s discuss the present situation of our nation towards children. But before that, have a look on the first sentence of Save the Children’s End of Childhood Report 2017- “For at least 700 million children worldwide – and perhaps hundreds of millions more – childhood has ended too soon.” These children are deny of each one of those experiences which we had, every one of those honest mistakes, innocent crimes, those adolescent amusement, school fun; in short they don’t have a genuine childhood. They are living a life which is not in the slightest degree considered as a child’s life. India is growing economically and advancing in technology yet at the same time have a large portion of the stunted children. Internationally India has been positioned first in having greater number of child who are stunted. India is even topping the least developed countries which is an exceptionally sad state for our nation, even nations like Pakistan, Sudan, Burundi, Rwanda, Bangladesh, Afghanistan etc. have less number of stunted children than ours. Stunting prevalence varies across states. The levels of stunting in children is above the national average in Uttar Pradesh (56.8%), Bihar (55.6%), Chhattisgarh (52.9%), Gujarat (51.7%), Meghalaya (55.1%), Madhya Pradesh (50%) and Jharkhand (49.8%). The report titled ‘Caught Short- How lack of toilets and clean water contribute to malnutrition’ was released by WaterAid, an international development charity and which has reported that our country has 54 million i.e. 48% children under age of 5 who are stunted. India has 33% stunted children in the world. The report said 1,40,000 children under five years in India are dying every year of diarrhoea I and lack of basic facilities . India has such number of stunted child due to lack of hygiene, cleanliness and toilets. 76 million children do not have access to safe water and 774 million live without adequate sanitation in our country. One of the WaterAid health and hygiene analyst, Megan Wilson-Jones said “India has the highest number of people in the world… practising open defecation, which spreads deadly diseases and makes children more susceptible to diarrhoea and other infections and so it is no surprise that so many children in India suffer from stunted growth”. Child health depends on the mothers health and in India 70% of girl child are suffering from Anaemia also, half of young girls are below the average body mass index, which affects the soundness of their future pregnancies and children. Preventing stunting is basic to survival in the prompt term, and in long term, to guarantee solid health, well educated and productive adults. With 595 million individuals in India defecating in the open, without toilets and without sufficient facilities, there is lifted danger of infections by bacteria. With mothers, birth specialists and other family members all conceivably taking care of child with contaminated hands, the chances of child illness and death are high. The End of Childhood index report stated more than 21 percent of girls between ages 15 and 19 are married in India by putting their health, education and everything at risk. Only one child among 10 in India gets adequate nutrition, and out of every 1,000 live births, 50 children under five die, a figure comparable to the poorer African island nation of Madagascar, India Spend had reported in May 2017. Here, 18.6% of children of primary and secondary age group are out of school and 47 million of upper secondary age are not going school. 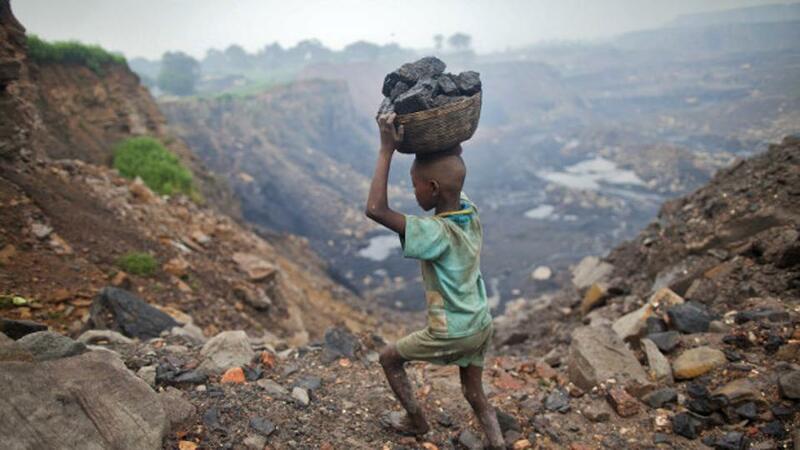 11.8% of children between 4-14 years, in India are working and miss their childhood. According to 2016 report of India Spend, half of all children are living on the streets in our country or they come from homeless families and work at construction sites, hotels and deprived from education. Our Prime Minister Mr. Narendra Modi has taken a step to clean up India since he came to power in 2014 and has repeatedly urged every household especially in rural areas to have a toilet within four years to end the spread of disease which lead to many worse situation which includes stunting and which effects the development of our country also. UNICEF has also stepped into preventing malnutrition and stunting from India, UNICEF India under UNICEFs water, sanitation and hygiene interventions now work with government to motivate people to use toilets. UNICEF has started programmes such as the National Rural Drinking Water Programme (NRDWP), and the Nirmal Bharat Abhiyan (Total Sanitation Campaign) which encourages people to construct and use their own latrines. UNICEF has offered the government for high-level technical support to demonstrate policies, practices and strategies that work, based on field-based data and evidence of progress in child survival. After researching deeply on this topic the author has concluded that India is confronting a more terrible circumstance in light of the fact that the vast majority of future generation of this nation are experiencing malnutrition, lack of education and dying in their more youthful age. Our country has highest number of people defecating in open and getting ill, stunted child are result of this practice. Many reports has pointed out the conditions and reasons of this situation, they have made it very clear that lack of education and nutrition are supreme cause that India has most number of stunted children. But the government is giving interest in diminishing this horrible problem and many schemes has been passed for cleaning the nation among which construction of toilet is best step. India need to look for its children more carefully and take more crucial steps in making it more clean and a place where children will not lose their childhood. Most of the children in our country are lacking in enjoying the best part of a human’s life i.e. their childhood. In spite of going to school they go for work, when they must be playing at playground they are working at construction site, when they should carry a bag full of books they are carrying sacks full of garbage and waste. They don’t get nutritional food to eat than they wash used plates of others. Their condition is much worse than the condition of older population of this country. Government should take more care of their kids as they are at their vulnerable age, they should be going to school than working under someone. And not only Government we all the people of our country must try to vanish this shameful situation of our country. Having most number of the stunted child is like a dark spot on the hem (aanchal) of our mother India. India Has The Highest Number Of Children Whose Childhood Is Stolen By Malnutrition: Report, , http://www.huffingtonpost.in/2017/06/06/india-is-the-world-leader-in-stunted-children-save-the-childre_a_22128144/ (last visited Aug 24, 2017). India has most number of stunted children: Study, The Hindu (2016), http://www.thehindu.com/todays-paper/tp-in-school/India-has-most-number-of-stunted-children-Study/article14511517.ece (last visited Aug 24, 2017). Unicef India, Unicef India, http://unicef.in/Whatwedo/10/Stunting (last visited Aug 25, 2017). India Has The Highest Number Of Stunted Children In The World: Report, The Logical Indian (2017), https://thelogicalindian.com/awareness/save-the-children/#! (last visited Aug 24, 2017). Unicef India, Unicef India, http://unicef.in/Whatwedo/10/Stunting (last visited Aug 26, 2017). India has most number of stunted children: Study, The Hindu (2016), http://www.thehindu.com/todays-paper/tp-in-school/India-has-most-number-of-stunted-children-Study/article14511517.ece (last visited Aug 26, 2017). India Has The Highest Number Of Children Whose Childhood Is Stolen By Malnutrition: Report, , http://www.huffingtonpost.in/2017/06/06/india-is-the-world-leader-in-stunted-children-save-the-childre_a_22128144/ (last visited Aug 27, 2017).